It’s 7pm on a Friday night and the bar is packed. 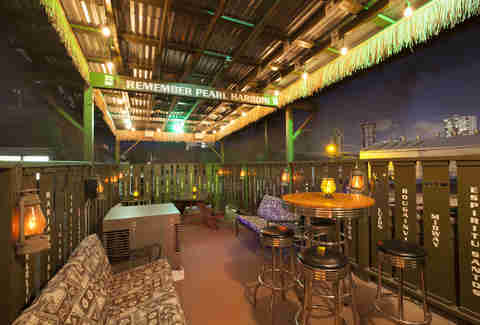 Inside, wartime photography and memorabilia cover the walls of this luau- and Tiki-inspired watering hole. Patrons share beers at long beer hall tables, while little replica WWII fighter planes fly by overhead on an automated pulley track system. In the middle of the room, guests take photos of -- and drink beer inside -- an authentic 1942 Admiral Nimitz Jeep, and a Vietnam-era tuktuk (auto rickshaw) used to shuttle airmen to their B-52 bombers. This isn’t your grandfather’s canteen bar. Wait, nevermind: It’s exactly your grandfather’s canteen bar. 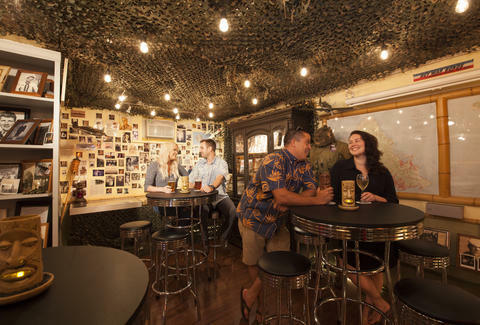 Down an unassuming alley off Ward Ave, this tucked-away spot is the Home of the Brave Brewseum, hand-built and assembled for a mission: to remember, honor, and salute America’s fighting men and women. At first glance, the interior of the bar resembles a T.G.I. Friday's or Ruby Tuesday; historical artifacts fill the shelves and antique signs cover the walls. But unlike those chain restaurants, the Brewseum isn’t filled with a jumble of ahistorical props. They’re telling a story, and an important one at that. Everything on display here, from the vehicles to the weapons and equipment to the photographs, is real, and has been donated by veterans as a way to share their experiences and honor the past. "Everything in the museum has been donated by veterans or their families for this purpose, as a way to pass the stories on to future generations," says owner Glen Tomlinson. "As the decades go by, the best way we can honor the legacy of these fighting men and women is to share their stories, so they never become forgotten." The Brewseum is part of a larger project: The Home of the Brave Tours and Museum, a series of tours for tourists and military enthusiasts to historic WWII sites on Oahu, such as the Battleship Missouri, the USS Arizona Memorial, Wheeler Army Airfield, Schofield Barracks, and the National Memorial Cemetery of the Pacific. Each tour finishes at The Home of the Brave Museum headquarters in Kaka‘ako with a showcase of hundreds of items, each with its own story and role in the war. It’s the largest and most comprehensive private collection of WWII memorabilia and artifacts in the Pacific. In 1991, history buffs Glen and Janet Tomlinson founded the Home of the Brave Tours in remembrance of the 50th anniversary of the attack on Pearl Harbor. They were inspired by firsthand accounts by veterans of their experiences in the war, as well as life in the Pacific. These veterans, and then many more, began to donate items that would come to form the museum that the Home of the Brave is today. The best part is that it’s not the kind of museum where you’re supposed to step back and stay quiet. "It’s a touchy-feely museum," Tomlinson says, about the Home of the Brave. "We want our guests to learn and experience as much as they can." Visitors are encouraged to take photos and explore everything from a WWII jeep to the 1942 Army-issue Harley Davidson motorcycle used in the film Pearl Harbor. They can feel the authentic soldiers’ uniforms on display, and gauge the weight of a 1940s-era US Army helmet for themselves. Or go upstairs and enjoy a cold bottle of Coke in the Wiki Waki Woo Tropical Bar & Lounge. The Tomlinsons have also created their own brewery at the back of the museum, and first debuted their own hand-crafted beer in the museum’s small second-floor lounge. The original beers, including such styles as the smooth Remember Pearl Harbor Dark Lager and the citrusy Pilot Pale Ale, proved extremely popular, and lead to the museum’s expansion to the building next door and the buildout of a new, dedicated “brewseum.” The museum now captures the spirit of Pacific life in the 1940s, honors the fallen, and helps us remember an important era in history with one of the least intimidating, most hands-on museums around. Cheers to that. James Charisma is a writer, editor, and photographer based in Honolulu. Check out his work and follow his adventures on Instagram @jcharisma.